Gigabyte M1600A PCSTATS Review - How well does it really work? Now, while there is obviously an IDE port and molex power connector at the back of the M1600A DVD-ROM, things start go a little differently here than with other optical drives. The IDE connector still hooks up to the motherboard, but the molex power connector needs to be connected to the included GM-100 control card which sits in a free bracket above the PCI slots (it doesn't actually plug into the PCI slot though). For users looking to install the M1600A DVD-ROM in a small form factor PC, at least one free PCI slot must to be free. The GM-100 control card pictured above does a couple crucial jobs. First and foremost, it provides the Gigabyte M1600A with power so that the drive can operate even when the PC is shut down, supporting the CD, MP3 CD, and radio functions. An AC adaptor plugs into the unit to supply it with DC voltage. Through a flat jumper cable, the control card is supplied with the antenna signal from the rear FM antenna, and audio in/out channels for external and internal devices. Gigabyte include short jumper cables for both the analog audio connector (typically found on the rear of CDROMs) and the headphone jacks on the back of the bracket. 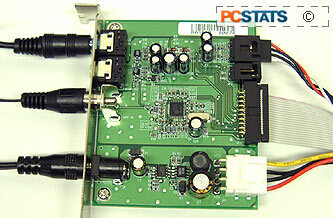 This allows the M1600A to accept an auxiliary audio source, or output its audio through an existing sound card when the PC is all powered up, or even just a pair of headphones when the computer is off. The sound quality from the Gigabyte M1600A is pretty good when it comes to MP3s or CD playback, and even managed to improve on what I expected from a digital FM tuner. The audio presets (pop, jazz, etc.) help enormously, and the lack of any noticeable background static or fuzz is definitely a plus. SRS is an interesting little audio tweak comprising SRS Trubass, 3D and WOW settings. Listening through a pair of Grado SR-80 headphones (there is no headphone jack on the M1600A DVD-ROM itself) it was clear that with SRS turned on, and volume set to higher levels, a small amount of background 'white noise' seemed to leak in. If dance beats are the tune to which you rock on, the SRS TruBass will quickly be your new best friend. Trubass kicks up the bass significantly, and if that isn't enough to get your party started, the SRS WOW setting allows virtual front and width adjustments to the sound (called punch and width). The remote that comes with the Gigabyte M1600A will allow you to change those settings with the press of a couple buttons, as there are almost too many options to pick through with the control dial. Volume controls work well up to the maximum limit without any distortion. The volume dial can be a little sensitive, and we found that if the dial is turned too quickly the M1600A looses resolution on the control and can't keep up. Turn the volume dial at a steady speed and everything works great. The remote is a handy way to adjust volume and CD track controls from a distance, but it is about the size of a credit card and likely to get lost if you're careless. On the M1600A we tested, the angle the remote had to be held at for its IrDA signal to be received by the M1600A was quite shallow, but the manufacturer has made appropriate adjustments to fix this we are already told. It might be worth mentioning that while the M1600A does indeed provide you with radio, CD audio and CD-MP3 audio playback, it is not a substitute for an existing sound card - it is just a superbly beefed up 16X DVD-ROM. The Gigabyte M1600A handles audio from the drive just as a typical CDROM might, so that means all PC-based sounds still need to be processed by the motherboard or add-on soundcard. Pg 3. — How well does it really work?